This past weekend I made a fabulous culinary discovery with my dear friend Jessica, based on an episode of Throwdown With Bobby Flay. In that episode, Bobby was bested by a champion liege waffle maker, leading Jessica to seek and find Shaky Alibi — a local coffee bar and wafflerie in West Hollywood. That the hell is a liege waffle, you ask? Um, it's freakin' amazing, that's what it is. To get a little more technical, it's a waffle made from yeast dough rather than batter, coated with Belgian pearl sugar, making it dense and chewy on the inside, caramelized and crunchy on the outside. We had ours two ways: sweet, with strawberries and preserves (they do not require syrup), and savory, with cheddar and bacon ... and Louisiana hot sauce. Naturally, I flipped for the juxtaposed flavors of pearl sugar and salty bacon, and the kick of heat put the whole thing over the top. Overall, the place is warm and friendly, with a charming staff and owner — the kind of place you hit often on weekends to grab a coffee, sit with friends, and otherwise relax. 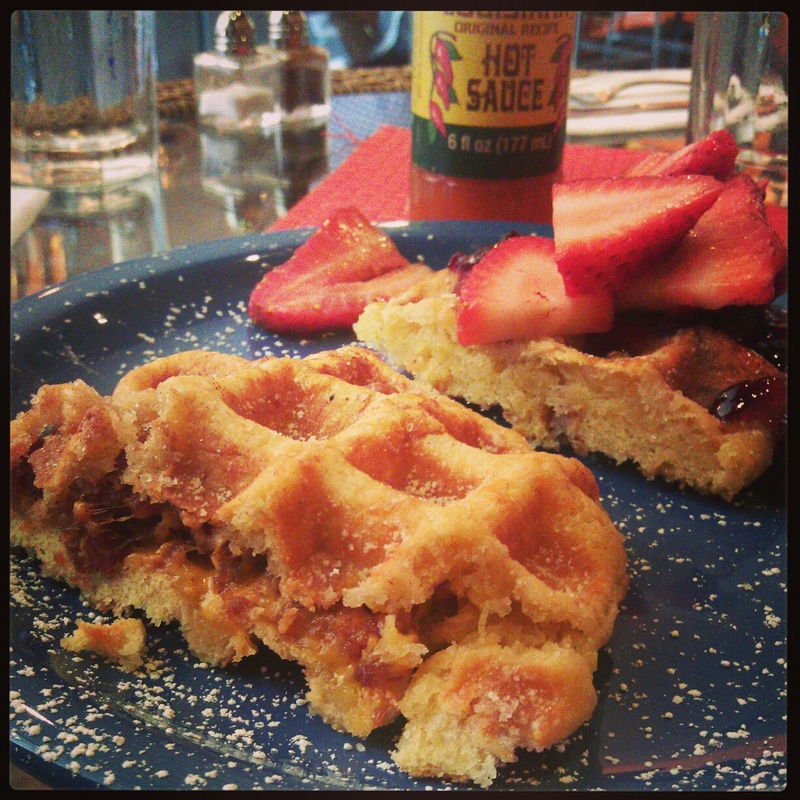 If you're from LA or just visiting, you won't find good liege waffles many places. A must try for locals and tourists alike.